If I like it, it's mine. If it's in my mouth, it's mine. If I had it a little while ago, it's mine. If I can take it from you, it's mine. If it's mine, it must never appear to be yours. If it just looks like mine, it's mine. If I saw it first, it's mine. If it's edible, it's mine. If you have something and put it down, it's mine. If I chew something up, all the pieces are mine. If it get tired of it, it's yours. If I want it back, it's mine. Don't come home smelling of other dogs. You must feed me every goodie you eat. Don't call me or lead me to a bath. Let me outside even though I just came in; there was an area I forgot to sniff. I can sleep anywhere I choose even if it means you trip over me. Don't shhhh me from barking while you are on the phone; I heard the wind blowing the leaves. Don't move me while sleeping sideways in the middle of the bed; you have enough room on the edge. Don't think you can leave a room without me. If it lands on the floor it's MINE! Welcome to Dal-Tex Basset Hound Club. 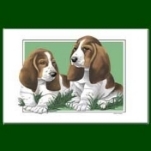 A club for all lovers of the Basset Hound whether they are conformation exhibitors, breeders, obedience, tracking, field trial or just a part of your family. Warm, funny, cute and extremely loveable, the Basset Hound is a purebred you can get to love in seconds and keep as a pet for a lifetime. Caring for him will be a pleasure. In return, your Basset Hound will shower you with some of the most beautiful moments in life. * Encourage and promote the responsible breeding of pure-bred Basset Hounds and to do all possible to bring their natural qualities to perfection. * Encourage members and breeders to accept the standard of the breed as approved by the American Kennel Club as the only standard of excellence by which Basset Hounds shall be judged. * To do all in its power to protect and advance the interests of the breed by encouraging sportsmanlike competition at dog shows, obedience trials, tracking trials, and field trials. * To conduct sanctioned and licensed specialty shows and obedience trials under the rules of the American Kennel Club. Dal-Tex Basset Hound Club, Inc.